London, 21st November 2018 – Eliane Fattal is a bit of an alchemist. She transforms and sculpts antique jewels to breathe new life into them and reveal their timeless beauty and significance to a contemporary audience. Next month, the artist-jeweller will present eight pieces created in close collaboration with Sotheby’s Diamonds, the retail boutique specialising in the world’s finest diamonds. The selling-exhibition will take place during Sotheby’s Old Masters Week in London from 30 November until 5 December 2018. Each piece is based on 19th or 20th-century jewels re-imagined to seamlessly incorporate rare, near perfect stones. The results are modern and playful pieces of high jewellery, marrying the flawless craftsmanship of past masters, the impeccable savoir-faire of today’s best diamond cutters and the matchless vision of an artist. The designs are also highly wearable and versatile: as in many of Fattal’s signature pieces, they can be taken apart to create different looks. Beyond their pure aesthetic and quality, all the jewels are intellectual conversation pieces. Like the Old Master paintings which will provide the inspired background for the exhibition, they are steeped in history and imbued with symbolism. 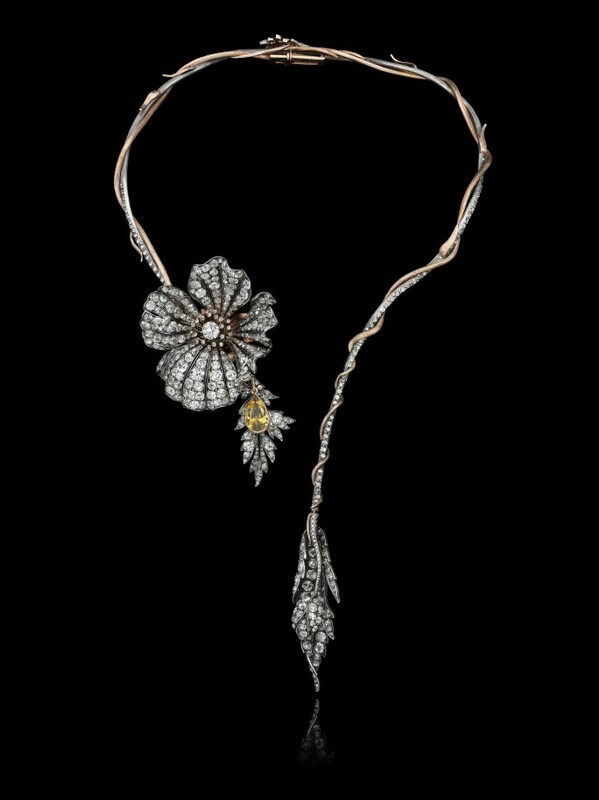 Emerging from a jewel dating from circa 1860, a diamond-set stylised peony in full bloom, with a diamond bud and a pear-shaped 3.31 carat diamond nestled in its foliage, winds itself naturalistically around the neck. Its undulating stem scattered with diamonds as the morning dew. 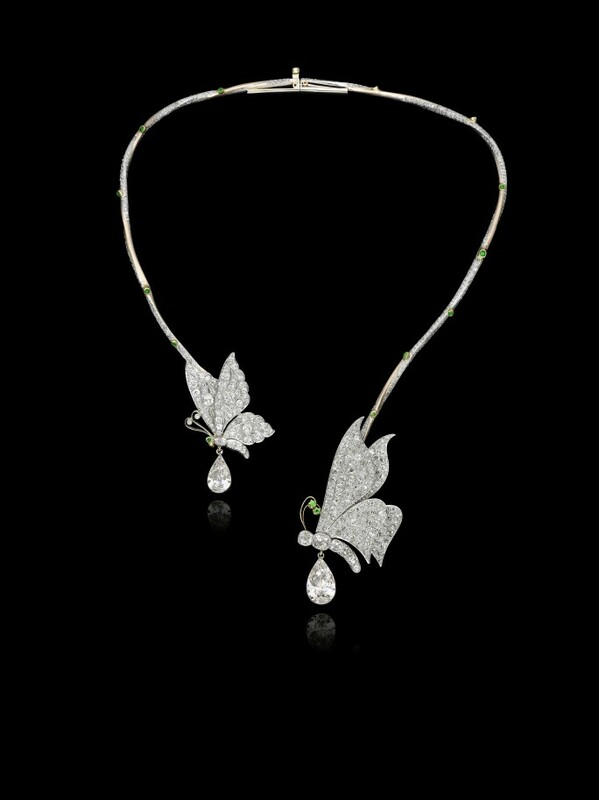 A pavé set diamond necklace with a pair of 19th century diamond butterflies with demantoid garnet accents, mounted in platinum and gold, carry two pear-shaped white diamonds: one internally flawless weighing 5.17 carats, the other VS1 of 3.09 carats. Because of its metamorphic life cycle, the butterfly is the archetypal symbol of transformation and mystical rebirth. The creature’s grace and beauty make it an emblem of the woman in Japan, where two butterflies dancing together symbolise marital happiness. In China, it is associated with the pleasure of life and high spirits. In Victorian times the butterfly was fashionable with jewellers and according to the Illustrated London News (1887): ‘Married ladies seem to be returning to the old fashion for lace lappets which are fastened with diamond butterflies’. Each jewel has been created from antique pieces reinvented by Fattal to enhance the breathtaking allure of some of today’s finest diamonds. A selling exhibition will take place during Sotheby’s Old Masters Week in London, 30 November – 5 December 2018.